Lately the dreams have been constant, but don't stay with me much longer after opening my eyes. This last one....well.......I'll try....and it won't be in order. It came down to assimilation. They were all very nice segments, but I saw the people I was with either disappear or see their attitudes start to change. Now and then there'd be one or more of us who had glimmers of an outside life....one of our own feelings and ideas. One woman, who could also see the same in me, that ability for independent thought - though I tried to conceal it, for fear of being found out - started to get attract a few bees, and then more, until they formed the shape of a bicycle helmet hovering just above her head. It was a threat - to her and myself. 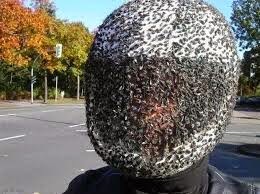 Any more independent thought and the helmet of bees would be on the head. Hers. Or that the same could happen to me should I not watch myself. There were also segments of the dream where I snapped at a 41 year old (yeah, I don't know how I knew he was 41, but he was) person who reported to me, because he didn't know what he should do because he had a headache. And then I was standing on a table taking pictures with my iPhone of a rally around a Wexner Center for the Arts type building. The rally was sloped below the building, accessible by going down a ramp - a sea of scarlet and grey, though mostly scarlet. Folks at the rally held cards, as if they were in a Block O -like situation. Workers who manned the tables, on one of which I was standing, didn't seem to mind me being there, but didn't encourage me to go join. One worker approached after I was at ground level and asked if I knew of anyone who was ill. I said yes, and he wanted me to join. I thought he meant the rally, but it became clear it was more of a prayer group scenario. He was annoyed when I declined the offer. There was also a snippet of me walking (or riding?) down Buttles Avenue side of Goodale Park, in Columbus. Morty was on the periphery, but I don't think he was with me as much as I was looking for him or supposed to be meeting up with him. When I awoke - or perhaps before - I had this moment of clarity (that is no longer clear), where I realized my blog was sedentary. That I was doing things too by the book and not actually saying things and that it all had to change. At that moment I knew what the blog had to become, though now I have zero idea. Perhaps subsequent dreams will lead me to that path. Damn dreams. For that half-second after waking everything is crystal clear ... and then it all goes to muck. I either wake up before I hit the ground or as soon as I discover I'm naked. I Have yet to found out if I die or am arrested. Hmm... maybe you just ate some bad pie?